Looking for Best Stocks to buy in India for long-term Investment? Well, today we will discuss a method to identify Best Stocks to buy for long term Investment. In the end, I will also share few best stocks for long-term investment. As you are reading this post, I assume that you are interested in stock market and want to grow your money. In order to do so, you might have read a number of stock market books, personal finance blogs, investment magazines. There may be a possibility that you have subscribed to Stock TIPS and recommendation of different brokers. Whatever the case, one thing is sure that if you don’t do your homework correctly you are likely to lose money in the stock market. You have to be firm in the selection of stock. 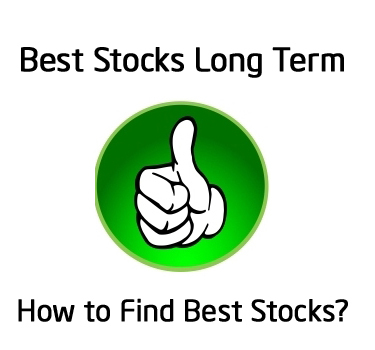 If you don’t know how to select stock here is a method to identify Best Stock for Long-term Investment. How to Identify Best Stock for long term Investment? First, you need to drill down to the fundamentals of the company. It is also known as Fundamental Analysis of the stock. The exercise of fundamental analysis will help you to filter out a fundamentally strong company. It is very important point for the selection. If the company is not fundamentally strong, there is no need to discuss further on its products/services, competitors, future prospects etc. For fundamental analysis, you need to look into financial of the company. Find out 8 financial ratio and 2 key indicators. I use screener.in website to find this detail. The details about 8 financial ratio and 2 key indicators are given below. If you are not aware of financial ratios you can go through – How to analyze Fundamental of the Company? Once the company is able to fulfill mentioned criteria you can go ahead and check next step. Quality of product and services are utmost important for the selection of the stock. Always invest in the companies that you understand. There is no point in investing in such company where product detail is not known or business model is not known. Ignore the stock market, ignore the economy, and buy a business you understand – Warren Buffett. The next point is checking the future business potential of the company. Always look for a company with long life at least 10 to 15 years. Find out if people will be using product and services of the company after 10-15 years from now. Logic is simple if product or service is having future demand company will get future business and make a profit. E.g If you are looking at the stock of IT Company you should look at present demand and potential growth in demand for the IT products or services offered by that company in future. Focus on the Future Productivity of the assets – Warren Buffett. A MOAT is a term coined by Warren Buffett. Moat means the competitive advantage of the company over rivals. You should check if a company is holding monopoly business or in the business where entry barrier is very high. E.g Telecom or Refinery where entry barrier is high due to cost and regulations. Another important point to check is if a company is holding high brand value with technological or cost advantage. E.g ITC is in the business of Cigarette with 80% of market share and enjoys nearly monopoly situation. Innovative products or Unique Selling product is another important factor in the selection of best stock. Let’s try to understand this point by example. You must have heard a success story of FMCG brand Patanjali. A unique selling point of Patanjali is natural Ayurveda based product available at low cost. Another example is Maruti Suzuki. Maruti enjoys the benefit of the largest service network. You will find service network of Maruti almost everywhere. That’s why people prefer buying Maruti cars in India. And hence, Maruti Suzuki is able to increase its sales consistently and give good returns to its shareholders. Also Read – Bluechip Stock – Should You Invest in Bluechip Stocks? Next factor for consideration is debt free status. A low debt company means extra competitive edge, increase in profit margin and high creditworthiness. Debt Free companies are companies with zero debt. Zero debt indicates that company’s financial health is very good. They are capable to withstand any type of economic conditions. The best example of a debt-free company in India is Hero Motocorp. Hero Motocorp generates enough revenue to finance all internal operations and investment requirements. Hero Motocorp has given very good returns to investors. The management of the company should be honest, dynamic and capable of handling any adverse situation. Management should be visionary and should be capable to allocate earning into new moneymaking venture so that it provides a high return on invested capital. It is not important that stock, where you invest, should be popular stock. Let’s understand this from Bollywood. Given a choice in Bollywood people prefer Shahrukh Khan, Salman Khan and Ajay Devgan for hit movies. It does not mean less popular star like Irfan Khan, Varun Dhawan is not capable of delivering hit movies. One should try to find out lesser known high-quality stock for the investment. Last but not least, you should also look at past performance history of the stock. Checkout at least past three years performance of the stock before making an investment. Past performance is not directly related to future return, however, it helps you to form a quick opinion about the stock. In short, ask following questions to identify best stocks for the investment. What are Fundamentals of stock? A stock is fundamentally strong or not ? Which products and services company is offering? Business Model of the company is sustainable? What are the future prospects of the company? Do company enjoys a competitive advantage over other? What is debt level of the company? How has stock performed in past? I hope you must have got a fair idea that How difficult it is to identify the best stock for the investment? Here are Best Stocks to buy in India for the long term. Net Profit – Net Profit of Maruti Suzuki is increasing YOY. Revenue – Revenue is touching new height every year. Earning Per Share (EPS) – EPS of Stock is very high and increasing every year. Price to Earnings Ratio (P/E) – PE ratio is high compared to M&M and other peer companies. Price to Book Ratio (P/B) – Price to Book ratio of Maruti is low. Debt to Equity Ratio – Maruti is nearly debt-free company with a ratio of 0.01. Return on Equity (ROE) – ROE is 17.44%. Price to Sales Ratio (P/S) – Price to Sales ratio of Maruti is low. Dividend Yield – Dividend pay-out of Maruti is increasing every year. From above data, we can say that fundamental of Maruti Suzuki Stock is very good. A business model of the company is sustainable. Future prospect of the company is very good. A company is debt free and giving a very good performance. New products in the pipeline and unique selling point of largest service network makes Maruti good choice for Investment. Net Profit – Net Profit of Shree Cement is increasing YOY. Revenue – Revenue of Shree Cements is growing. Earning Per Share (EPS) – EPS of Shree Cement is high. Price to Book Ratio (P/B) – Price to Book ratio is low. Debt to Equity Ratio – Shree Cement is nearly debt-free company with a ratio of 0.17. Price to Sales Ratio (P/S) – Price to Sales ratio is low. Dividend Yield – Dividend yield of the stock is high. Shree Cement is a fundamentally strong company with sustainable business model. Shree cement enjoys the benefit of low production cost. It is debt free company with good future potential. Another Best stocks for long-term investment in Hero MotoCorp. Analysing fundamentals of Hero MotoCorp. 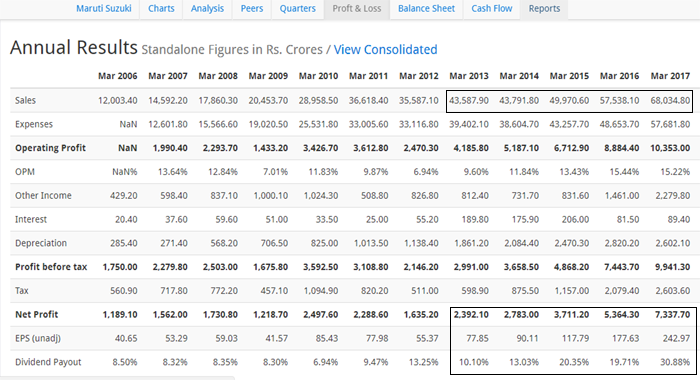 Net Profit – Every year Hero MotoCorp is giving better result in terms of Net Profit. Revenue – Revenue of Hero MotoCorp is maintained. Earning Per Share (EPS) – EPS of Hero MotoCorp is growing every year. Price to Earning Ratio (P/E) – PE ratio of Hero MotoCorp is low compared to peers. Debt to Equity Ratio – Hero MotoCorp is completely debt free. Return on Equity (ROE) – ROE is 34.66%. Dividend Yield – Dividend pay-out of stock is good. Hero MotoCorp enjoys a very good market share in two and three-wheeler market segment. Hero MotoCorp enjoys Technological Advantage over other companies. Hero MotoCorp is one of the Best stock for Investment. If you are DIY (Do Your Self) investor you should invest in the stock based on fundamentals and research. Remember points given here before selecting any new stock for investment. Also, let me know if method given here for the selection of Best stocks for investment is useful or not? Happy Investing! Sir you are doing a great job. Please give me five of your favouite shares for the next 3 – 5 years. Would be grateful for your prompt response. I have already given three best shares in my article for long term investment. Dear Sir, Thanks for the writing which is quite simple manner and easily understandable one. manner how to identify the stocks by Technical Analysis. Eagerly awaiting.